Roller conveyors are one of the important categories of wide range of Package-Handling Conveyors available. These are suitable for unit handling only and convey bags/boxes/cartons. Roller Conveyors are basically Rollers mounted on supporting frame at specific spacing. The frames supporting the rollers are generally either channels or angels. The rollers should be 2 to 3 inch longer than the largest width of package to be handled. They can be either gravity type (non-powered) or powered. In case of short distance conveying, gravity conveyors are mounted at some inclination to generate movement of load by gravity. For longer distances or where the load is to undergo operations in between, the conveyor needs to be mounted horizontally and the article is pushed as required. In powered roller conveyors, a single shaft runs below the rollers running the length of the conveyor. On the shaft there are a series of spools; one spool for each roller. A rubber O-ring runs from a spool on the powered shaft to each roller. When the shaft is powered the rubber O-ring acts as a chain between the spool and the rollers, making the roller rotate. 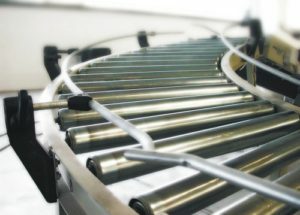 The rotating of the rollers pushes the product along the conveyor. The shaft is usually driven by an electrical motor through gear reducers and chain or belt drive. Aegis Engineering is a leading Roller Conveyor Suppliers, Manufacturers, Exporters in Ahmedabad, Gujarat, India.